James Richards Carnahan, Past Department Commander of Indiana, Grand Army of the Republic and Major General of the Uniform Rank, Knights of Pythias of the World was born in Dayton, Tippecanoe, Indiana November 18 1841. 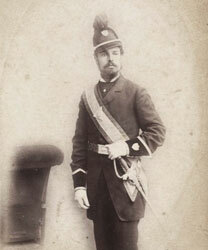 The Uniform Rank, Knights of Pythias, grew out of various drill corps units that had been organized in the various lodges after the order was originated in 1864. Bear in mind that many of the members of the Knights of Pythias were men who had been active in the Civil War and who enjoyed the disciplined way of life. Although actual numbers are not available to me at this time, I believe that there were more than 100,000 members at its height. As the veterans of the Civil War began to pass on, there was a declining interest in the Uniform Rank, and the membership began to quickly drop after WWI. This writer helped to form one of the last Companies ever organized in about 1950 and attended one of the last national encampments ever held. Shortly after that time, the Supreme Lodge of Knights of Pythias removed the Uniform Rank as an official auxiliary of Pythianism. About 1995, after retiring from business life, I undertook to find if there were any companies left in existence. I found one Company in Maryland that supposedly was still in existence. I exchanged one letter with a member and thereafter there was no response. On January 1, 1999, as one of the only persons still alive who had actually belonged to the “Rank”, I proclaimed it revived as a memorial group so that the memory of this fine fraternal group might not be lost to the memory of present day members of the Knights of Pythias. I have taken no further steps to carry it further but have in my possession a number of papers, what is probably the last Book of Laws that was ever published, and two copies of the ritual. strictly Knightly or military basis, was certainly noted in 1871. The Parent Order itself was only seven year old so that the Uniform Rank must have been established soon after. Although it appears that each company was independent of the other until the Supreme Lodge met in 1871.
the helmet, oriflamme gorget or cloak, and was not to be changed for at least ten years. The colors of the cloth, plumes, cap and the style of the insignia were given but not distinctive enough. formed should be left to the judgment of the Sir Knight themselves; and at every Supreme Lodge Convention hundreds of Sir Knights should be seen in every conceivable style of clothing and color of materials and not infrequently boarding on the burlesque, as a linen duster or a coat of mail. was that a Resolution was offered calling for a special uniform to be adopted over the Supreme Domain. There appears to have been a great many obstacles in the way of a permanent and abiding uniform, but evidently these were eventually overcome by the strong and untiring efforts of the men at the helm of the Order who were determined to bring about a Uniform Rank. It would be first in Military requirements, and worthy of the Order, Knights of Pythias. shaped their actions on the tactics and general laws so as to meet the demands of the rank. The tactics were prepared with an eye to the greater and more perfect organization. Military discipline, as far as applicable, is enforced at all proper times, military law and the customs of the service are authorities when relevant. Court-martial, general and regimental are constituted, proceed and exercise jurisdiction like similar courts in the army. The punishments are limited to dismissal, suspension and reduction in rank. Minor cases, requiring discipline are disposed of by the Sir Knight Captain. gives promise of a brilliant future. Pythias the next few years will witness the formation of an army of true soldiers, upon whose banners my be faithfully inscriber: "God and Our Country". this year (1941) Perhaps is is appropriate that a short account of the Rank in California, especially, would be interesting. quite active since late in 1881. And they were, to all accounts, very enthusiastic. make a splendid display of its competency, good drill, neat and tasty uniform at the funeral of the lamented President of the United States, James A. Garfield. the public funeral of Past Grand Chancellor, Jeremiah Whalen. inducement to have them join the ranks. And in 1932, $1,000 of the Uniform Rank was transferred to the Endowment Fund of the Pythian Home. some comments in his Annual report to the Grand Lodge, after which some activities were aroused. The present revival is evidently the result of the combined efforts of these Grand Lodge Officers. 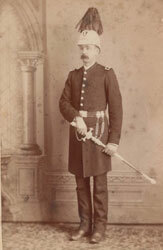 Rank of Knight, circa 1870's. 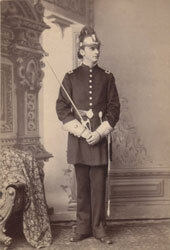 Original style Uniform Rank uniform 1870's. 1880's, Was later "open" lily of the 1890's.